NM Automation and Control Private Limited - Manufacturer of hydro pneumatic with pressure switch, hydro pneumatic with pressure sensor and vfd & gsm starter panel in Mumbai, Maharashtra. Ease of Operation, Ease of Wiring. 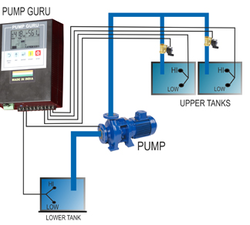 This is used for One Pump operation where all the parameters such as Voltage, Current, Auto/Manual, Water Tank Level & Error Alarms would be displayed with respect to that pump. 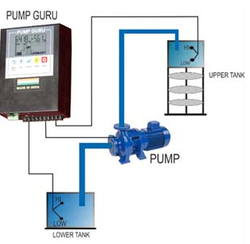 There are 3 Pumps which operate as per the pressure input provided by the Pressure switch. In this when the pressure is at normal value only one pump would be operated. When the pressure drops below set value & the operating pump is not able to fulfill den the drive would start the second pump & similarly third. If the set value is achieved, then it would gradually stop the pumps in the manner they started. Until the top level is High the pump would be filling & after it is high the pump would stop. This helps in preventing repeated starts thus protecting the pump. If bottom tank level is High, then only it would fill the TOP Tank. 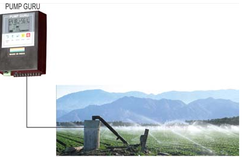 User can use LEVEL PROBES or FLOAT SWITCH to measure the level of the Bottom & Top Tanks. 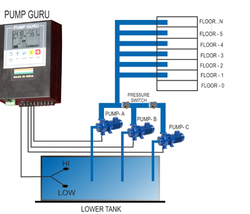 There are 3 Pumps which operate as per the pressure input provided by the Pressure sensor. In this when the pressure is at normal value only one pump would be operated through drive. When the pressure drops below set value & the operating pump is not able to fulfill den the drive would start the second pump & similarly third gradually increasing the speed of it. Maximum 3 pumps can be operated. Ease of Operation through SMS & Mobile Application. User needs to send SMS to the GSM Modem & in turn will receive the feedback of the request such as Voltage, Current, Auto/Manual, Water Tank Level & Error Alarms. Using Mobile ApplicationUser can login with the predefined Username & Password. Graphically all the parameters of Voltage, Current, Auto/Manual, Water Tank Level & Error Alarms would be displayed. User can change the Current Set Value, as well as change the Auto / Manual Operation. 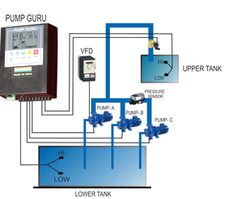 Pump Guru Can Be Operated Using Gsm Modem Via... SMS Mode. Status Such As Voltages , Currents , Errors , Auto / Manual Will Be Shown. User Can Assign Rights For Operations To Customers. Switch ON and Switch OFF motor from App. 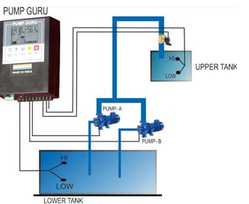 User can use LEVEL PROBES or FLOAT SWITCH to measure the level of the Bottom & Top Tank. If the level of the Top Tank falls below the LOW, then only the pump would start to fill it checking the level of the bottom tank also. This helps in preventing repeated starts thus protecting the pump. If bottom tank level is High then only it would fill the TOP Tank. If the level of either of Top Tanks falls below the LOW, then only the Solenoid Valve would be opened &pump would start to fill it checking the level of the bottom tank also. 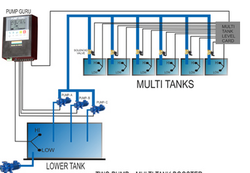 When both the levels of the tanks are High & both the Solenoid valves are closed then only the pump would stop. This helps in preventing repeated starts thus protecting the pump. If bottom tank level is High then only it would fill the TOP Tank. 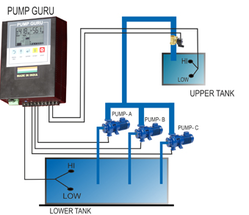 There are 2 Pumps which operate in Cyclic Mode for filling the Top Tanks thus utilizing the pumps with optimization. Timer ON & Timer OFF means user can set the time in mins for the Pump to be Switched ON & also time for which it has to be kept OFF. 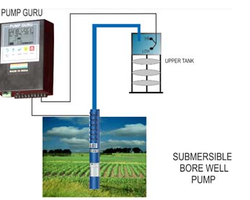 This is basically helpful for borewell where the well gets dried up for some time & then gets again filled up.